DIRECTIONS:For adults, take one (1) capsule before or with milk products. Other Ingredients: Gelatin, Rice Powder. CONTAINS NO: Artificial coloring, artificial flavor, preservatives, yeast, corn, milk or milk derivatives, lactose, salt, sodium, soy, sugar, gluten, starch or wheat. WARNING: If you are pregnant, nursing or taking any medications, consult your doctor before use. Discontinue use and consult your doctor if any adverse reactions occur. CAUTION: DO NOT USE IF YOU HAVE HAD AN ALLERGIC REACTION TO PRODUCTS CONTAINING LACTASE ENZYME. For people who like milk products but whose systems do not tolerate them well. Each capsule contains (100 mg.) of lactase to help break down milk sugar. Enjoy all your favorite milk products again! Lactase is a digestive enzyme that helps break down the sugar in milk and dairy products. Supplementing with Advanced Lactase Enzyme can make milk more readily digestible to your system. This product is ideal for people with lactose intolerance, whether eating at home or eating out. 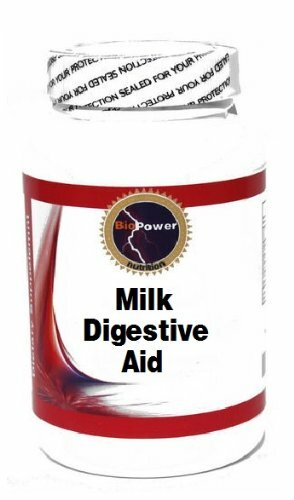 This product may also help reduce the effects of poor digestion, including heartburn, gas and other occasional gastrointestinal discomforts. If you have any questions about this product by BioPower Nutrition, contact us by completing and submitting the form below. If you are looking for a specif part number, please include it with your message.